The shader compiler (located in the lumberyard_version\dev\Tools\CrySCompileServer\x64\profile\CrySCompileServer.exe directory) is running on your PC. For information, see Building Shaders for Android Games. You are using Android NDK r11 or above. For information, see Android Support. Lumberyard Editor includes a plugin that allows you to build and deploy Android applications. If you change your default project, you must ensure the new default project is set for the enabled_game_project parameter in the user_settings.options file. You can find this file in the lumberyard_version\dev\_WAF_ directory. In a command line window, run the lmbr_waf.bat configure command before you start Lumberyard Editor and the Deployment Tool. This command processes and creates the appropriate files for your project. In Lumberyard Editor, choose File, Project Settings, Deployment Tool. Android ARMv7 – Targets 32-bit Android devices. This option enables the greatest range of compatibility. Choose this option if you are unsure of the device type. Android ARMv8 – Targets 64-bit Android devices. This option targets newer Android devices and typically offers a performance increase over ARMv7. You haven't built your game project for the Android target that you specified. There are code changes to your game project since the last build. Local Files – Loose compiled assets are copied to Android devices after the executable file is installed. This allows the game to run faster. If you select this option, you can't enable hot reloading of assets. Use Virtual File System – Assets remain on the PC and the game retrieves the assets at runtime as needed. This option allows assets that support hot reloading to update automatically in the game if changes are detected on the PC. Click Deploy to build and deploy the game to the Android device, start the remote shader compiler, and then launch the game on the Android device. You can view the progress in the Deploy Output console. In the Base Options, clear the Build Game check box. In the Platform Options, clear the Clean Device check box. When you clear these options, the Deployment Tool won't build or install the executable, which is only required if you make code changes for your game project. If you add new gems to your game project, you must select the Build Game check box in order to include the features of those gems. The Deployment Tool provides the following options that you can set to build and deploy your game. Profile – Balance between performance and debug capabilities. This is the best option for creating content and iteration. Debug – Slower but provides the best debug experience. This is the recommended option for engineers. Release – Best performance, but lacks debugging capabilities. Logging is severely limited. Local device to which to deploy the build. This list is auto generated from connected devices. If devices are not found, No Devices Connected is the only entry in the drop-down menu. IP address of the target device. 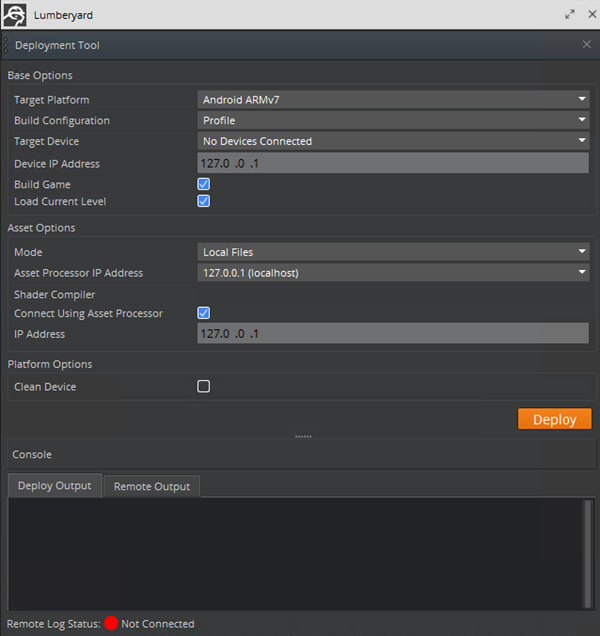 You can specify an IP address to connect the device for remote logs and whitelist the device to connect to Asset Processor and the shader compiler. [Android only] If you specify the localhost, this will automatically configure port forwarding for the respective connections. Generates a new build for the Target Platform before deployment. Toggles between the normal game startup and starting from the currently open level in Lumberyard Editor. This option is ignored if a level is not loaded in Lumberyard Editor. Local Files – All individual asset files will be pushed to the target device. Virtual File System (VFS) – A small subset of required startup files will be pushed to the target device and assets will be served through a connection to Asset Processor. This enables the hot loading of assets. Specifies the address used for VFS connections when Asset Processor handles shader compiler requests. This list is auto generated based on the available network adapters. Connect using Asset Processor – Connect to Asset Processor for all shader requests instead of directly to the shader compiler. Choose this option to unify connections to your host machine. IP Address – IP address of the shader compiler. Uninstalls the game project from the target device before deployment. Deployment time will increase. If you made changes to game content, the executable will be reinstalled each time. Displays the deployment process, including errors. Once the deployment process successfully launches the application, the device runtime logs appear. At the bottom of the Deployment Tool, the Remote Log Status shows which device, if any, is currently receiving runtime logs. You can build your game for Android using Clang. Building for Android (ARM) in Visual Studio will build using Clang. Ensure you are using Android SDK 21 or later and Android NDK r11 or later. For information, see Android Support. In a command line window, navigate to your lumberyard_version\dev directory. Debug your application. For information, see Android Debugging.